La Pinetina Residence & Restaurant has been delightfully restored in an Alpine style and although close to the centre of Ovindoli, sits in tranquility among pine trees. The comfortable apartments are well furnished and in the evenings La Pinetina’s bar and restaurant are open. The slopes of Ovindoli Monte Magnola are less than 10 minutes away on the ski shuttle. *Price based on 6 sharing a one bedroomed apartment for 7 nights in low season. Initial cleaning is provided with sheets and towels changed midweek for stays of more than four nights. Free wifi is available in all apartments. There are six comfortably furnished one bedroomed apartments, all with views of the pine woods. Each lounge area has a wood burning fire with a basket of wood, a small kitchen area with oven and microwave, double sofa bed, television (Italian channels) and video entry system. The main bedroom has a large double bed with hypoallergenic mattress, wardrobe, safe and television. Each bathroom has shower, wc, complimentary toiletries, hairdryer and heated towel rail. Three apartments are on the ground floor with doors opening onto the garden, while the upstairs apartments have balconies. There are three of these very comfortable apartments each with two bedrooms and a main lounge with wood burning fire with a basket of wood, double sofa bed, kitchen area with oven and microwave, television (Italian channels) and video entry system. The main bedroom has a large double bed with hypoallergenic mattress, television and safe. The second bedroom has bunk beds and wardrobe. The bathroom has shower, complimentary toiletries, hairdryer and a hydro massage bath for two people with chromotherapy, ionizer and radio. After skiing the bar and restaurant of La Pinetina open for the evening. Enjoy an apres ski drink or an aperitivo before dinner. In the restaurant, where tempting local and regional Abruzzo specialities are served. The extensive wine list offers many Abruzzo and Italian wines to complement the tasty food. 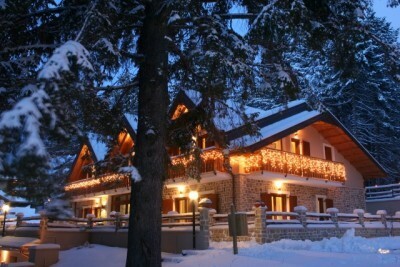 La Pinetina Residence guests receive a 10% discount in the restaurant and 20% discount for takeaways.